It’s rare that we cook without a starch in mind but this soup is hearty enough and most definitely comforting enough that you may not need a starch. If you really wanted, this would be a good occasion to break out some crusty Italian bread. 4. when onions show signs of transparency, toss in the chicken, mix well. 5. 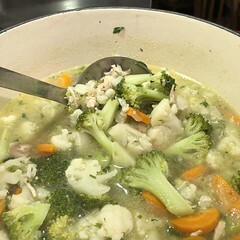 When the chicken is cooked, toss in any bits and pieces of the broccoli and cauliflower stalks. Let cook for 5-10 minutes allowing the stalks to soften. 9. Continue adding the remaining liquid a single cup of water followed by the stock allowing to return to a simmer each time. This would be 3 cups of water and 3 cups of stock.